That's not what was said or happened. At all. The problem is how a MINORITY segment on the right expects to dictate to the party what constitutes a "Republican". And if their minority segment opinion does not overrule the majority segment opinion, the pretense is made that the party officials are no longer "Republican". There's no confusion in that. Once again there are 16 presidential candidates representing a diversity of views, which of these candidate's supporters are the minority dictating what it is to be a Republican? Of course there is no definitive answer you just want to spout partisan invective about Republicans not knowing what the majority of their party thinks. Once again there are 16 presidential candidates representing a diversity of views, which of these candidate's supporters are the minority dictating what it is to be a Republican? I'm not talking about the presidential candidates. In fact, as I have explained in the past the Republican presidential nomination is an example of what I am talking about. Because the party as a whole gets involved in the nomination process, the Republican presidential candidate that succeeds in the nomination process is typically a better representation of what the party wants. And then what happens is other people in the party (a minority) start labeling their candidate as a "RINO". Of course there is no definitive answer you just want to spout partisan invective about Republicans not knowing what the majority of their party thinks. "In April, a bill that would have expanded background checks on gun purchases did not receive enough votes in the U.S. Senate to pass. If it comes up for another vote, do you think Congress should pass a bill that expands background checks for gun purchases, or not?" And which position did the Republican elected officials follow? And this is an interesting fact about how this survey was conducted. They asked the youngest people they could find, and the young are notoriously liberal. Now let's do the same survey with people who are ages 35 to 50 and see what kind of results you get. more likely because we are at another watershed. Some of our generation will not live to vote in the next election. It says that dems are more favorable on Abortion, Climate, and Education. Is that supposed to be good? They help kill babies and sell their body parts, they tell people that higher taxes will give us better weather, and our education system has been failing our children for decades. Great! Give me some proof Democrats sell body parts. What could possibly convince you? Tells us a scenario that would make you say, "Hey PP is selling parts of babies for money" Since videos of different directors saying they do it isn't enough, I guess only the word of the almighty will change your mind, huh? Guess enough people see through the right's campaign of ever raining b.s. if its proved in the ongoing investigation. 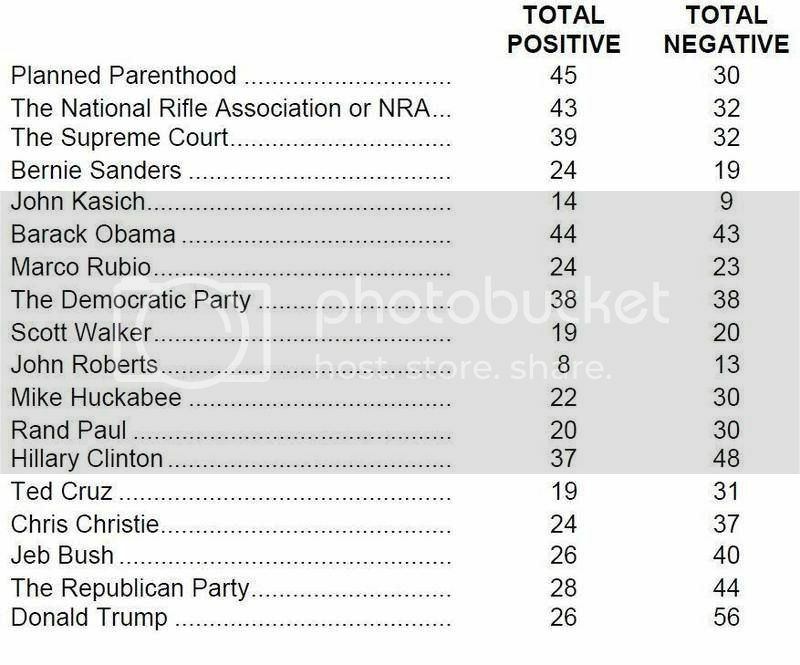 Gee you notice both numbers the Democratic Party was rated at? "38"
Just how great is 38 out of 100? Also I don't believe every Dem is in the party for the same reasons. Sense it has such a wide arena. Plus the very Rich have their goals while some average Dem person has theirs. Just another reason this party has so many people in it. No real direction. As with these numbers. Last polls showed Hillary & Sander's were about the same as Sander's number are on the rise. Conservatives continue to hold an enormous advantage over liberals in this country.